This customer appointed Divine Integration to build a six screen video wall, which would become the focal point of their NOC (Network Operations Centre). The screens employed were NEC5220 Multisync monitors mounted in a 3 x 2 arrangement supported by a bespoke pole and bracket system. This client didn't want a dual pole per screen system so we discussed this with the manufacturer to ensure a three-pole system - one per two screens - would work for this requirement. We installed an adapter in the centre of the poles so that all of the cables - power and DVI - could be routed so that they couldn't be seen. The screens were then utilized to monitor their client's networks for potential congestion or connection problems. Audio was provided by two wall-mounted speakers connected to one of the PCs running the images on the wall. two VGA and audio laptop connection positions. lighting circuits - a mixture of LED feature lighting, fluorescent fittings and low voltage down lighters these were either dimmed or switched using Crestron dimmer units and relays. 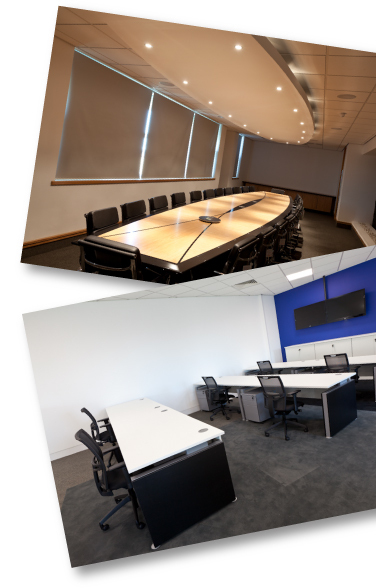 Using the Crestron bespoke control network, Cresnet, Ethernet and Wireless connections, everything can be controlled using either pre-programmed settings or all items can be controlled manually to suit a particular requirement or presentation. Divine Integration were asked to install a Category 5E UTP (Unshielded Twisted pair) into a new corporate headquarters for a well-known logistics company. This Hellerman Tyton system incorporated over 600no outlets over two floors radiating from a Server Room on the ground floor. The cables were terminated in two communications cabinets and arranged so that a 48-port PoE (Power over Ethernet) switch could be installed to serve the panels immediately above and below it. All ports were patched with custom-made patch leads creating a very neat, tidy and manageable patching field. 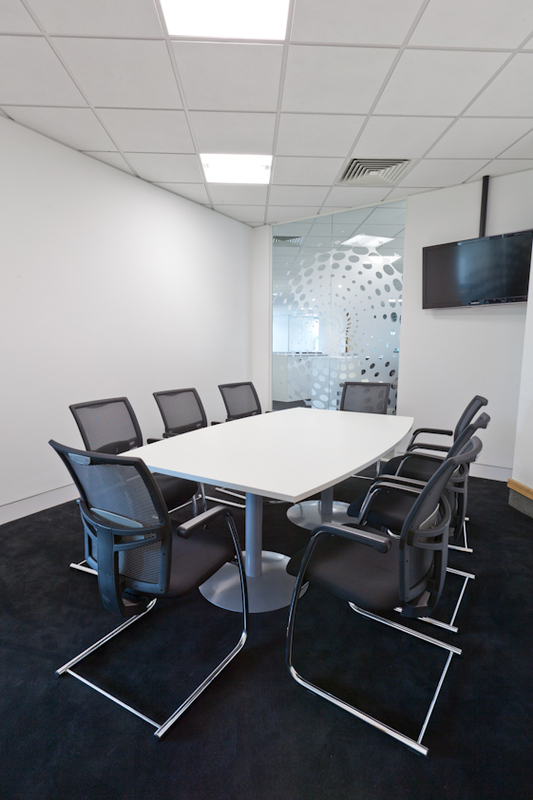 In this instance, the client appointed us and we worked alongside the main fit-out contractor. For this project, Divine Integration was appointed to install both the structured cabling systems and an Audio Visual system. In total, nearly 1300 Category 5E UTP outlets were installed using an Excel cabling solution. These were cabled per floor and we connected the cabinets using optical fibre and 24 Category 5E UTP links. In addition to this, we specified, supplied and installed a Sky distribution system over Category 5E UTP to over 30 locations around the building radiating from the main Server Room on the 1st floor. This system incorporated and distributed 8 Sky channels to the designated locations around the building, some of the screens had channel changing capability, some of the screens were required to have fixed channels, the channel determined and changeable, at the cabinet in the server room. 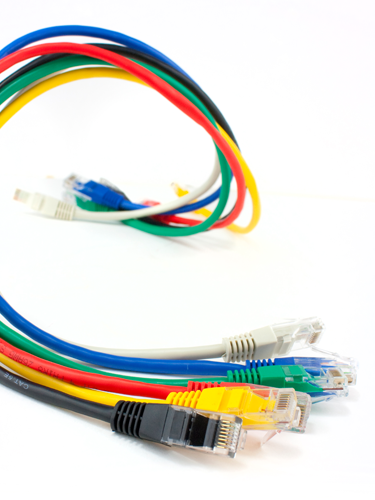 We have used Divine Integration to fulfil cabling requirements for our customers over the past years. No matter how difficult the job, or technically challenging, they always come up with a good solution, putting the customer first and never settling for second best. Divine Integration is always our first port of call for any cabling requirement, I feel safe putting our company's reputation in their hands. Divine Integration has recently provided installation services on behalf of our company to several customers. The attention to detail and dedication to the work is impeccable. We would have no hesitation in recommending and using Divine in the future knowing that they will always act in our best interest. Divine Integration has been carrying out design & installation works for Kube for nearly 10 years, including small, medium & large data projects. Every project has been given the same level of meticulous attention to detail, no matter what the size or value. Divine continue to impress with their service levels, knowledge of the industry and manner in which they act on our behalf - all hugely important factors for Kube and the reasons why we continue to work with them. In the past three years, Divine have also designed and installed numerous Audio Visual installations for our clients which have been a huge success. We would thoroughly recommend using Divine Integration's services and look forward to working with them on future projects.